Fijian authorities have issued a severe flood warning for the whole island group, following days of heavy rain in the Pacific nation. With thousands of people in emergency shelters, officials warned that more downpours would trigger fresh floods. Storms since late last week have left at least eight people dead. 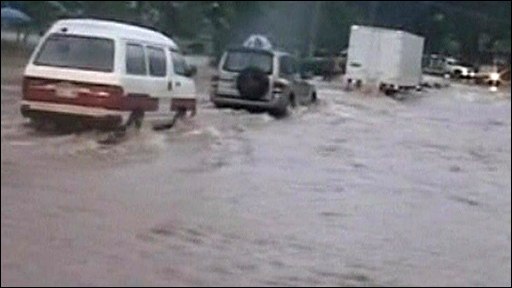 Meteorological Service director Rajendra Prasad called it "the worst flooding situation in the recent history of Fiji". "Two peak floods one after the other" was unprecedented, he told the Associated Press, and heavy rain was forecast for the next two days. Five days of rain have inundated towns, washed away sugar cane crops and submerged roads on the main island of Viti Levu. A state of emergency has been declared in western parts of Viti Levu, with the main tourist hub of Nadi badly affected. Many families are said to have moved to higher ground; about 5,000 people have been forced into emergency shelters, the Fiji Times said. Residents in Labasa, the main town on the island of Vanua Levu, are also braced for the worst after two rivers burst their banks, Fijilive website reported. Australia and New Zealand have promised emergency funds to the Fiji Red Cross to help with relief work, despite the current diplomatic chill. Both countries have sanctions in place against Fiji's military government in the wake of the December 2006 military coup.